The first episode of Mrs. Wobbles and the Tangerine House was an IFComp entry in 2013. (Here’s my review.) It is a choice-based Undum children’s story about a group of foster children who go to live in the home of the eponymous Mrs. Wobbles, and the whole story is being told through a magical book. Reading as an adult, one has a distinct sense of not being the target audience, most of all because of the slightly teasing tone the narrator adopts towards the reader. 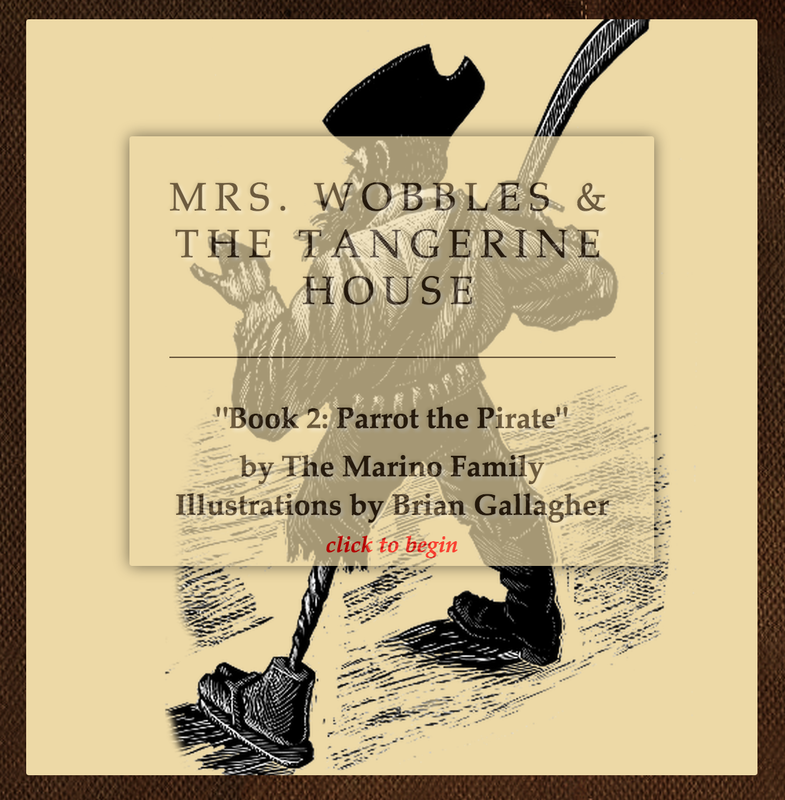 This installment, Book 2, picks up with the children transported to a pirate land. We again have the framing narrative of a magic book, and then at one point Mildred (one of the children) can herself tell about a memory of hers, so the layers of story and other-reality get fairly thick. The front was guarded by a big pirate henchman, who looked like he wanted to be anywhere but there, as if he were missing his favorite TV show and perhaps even his favorite episode of his favorite TV show. Book 2 is not the end, either. There’s apparently meant to be at least one more in this series. All the same, Book 2 more or less stands alone, and it would be possible to read it knowing little more than I’ve just outlined. To go into more detail about the story will require some spoilers, however. The surface story, conducted in the realm of make-believe, concerns the foster girl Mildred learning to do battle with a ferocious pirate by playfully rhyming his words in a poetic re-envisioning of the insult duel. Her uncle lost his custody of her, lost the fish shop, lost his mind, and finally lost his life to complications from drinking too much, liver failure. …and I wasn’t really sure what to make of the handling of this. The uncle’s abusive comments and actions are sometimes rather stylized, but not to Lemony Snicket levels, not enough that one could write them off as being pure imagination. They tend to represent more a bare-bones and unsophisticated accounting of something that could actually happen. “Lost his mind” is not how I would describe alcohol-related dementia; but how would I imagine a child describing it, assuming a young child whose life circumstances unfortunately required them to be aware of such phenomena? I’m not sure. And I know too little about working with children from traumatic backgrounds to have a good sense for how this might go over: would it seem misjudged? clueless? or reassuringly matter-of-fact about something horrible, sunlight into a dank place? Maybe. Some of the story’s authors were children, which is perhaps indicative. So I feel ill-equipped to judge some aspects of this project. However, it’s clearly made with attention; I ran into a couple of typos here and there, but it benefits from handsome Undum typography, a good illustrator, and some entertaining turns of phrase. Incidentally, Mark Marino has written about an interactive story exercise he likes to do with children, which is also worth a look. This entry was posted in CYOA, interactive fiction by Emily Short. Bookmark the permalink. Is that skeleton checking out its pelvis in the mirror? You think you’re joking, but that’s not a million miles from what’s actually going on. 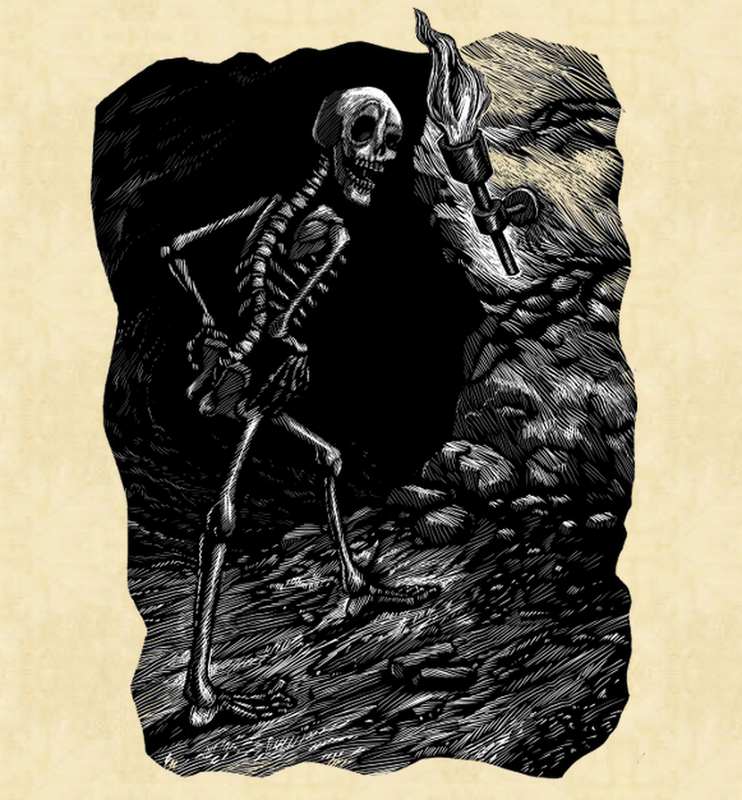 Link to this second book? or release date… or something, better before the spolers section. http://markcmarino.com/tales/storybook2wobbles.html — I’ll add it in the story body too. Sorry. Thanks for the attentive review, Emily. The kids and I enjoyed reading your feedback! My daughter has read your Versu stories and LOVED them. My son’s a little young for them yet. You wonder aloud about the handling of the uncle’s death, questioning the approach. I can’t speak to the effect of that line, but I would say that in the Mrs. Wobbles storygames, the kids and I have been trying to mix a magical or fanciful reality with a realistic emotional one — more realistic then say “A Series of Unfortunate Events,” which you make reference to. At the same time, I’m aware that some of our readers (whether reading to themselves or more likely being read to) are quite young, 7 or 8, for example. For that reason, we try to handle the scenes of loss with gravity but also a certain amount of brevity, this plainspoken approach you mention. We want to indicate the loss in the language a child would understand while giving sufficient cues to the adults of the larger story. I do something similar with the fire scene in The Mysterious Floor. The goal is to allow for some magic (yes, lightness in dark) in the midst of stories of loss – not cartoonish loss as in the case of Lemony Snicket’s tales or even SOME Roald Dahl– but real loss. We’re gesturing toward a world of foster children that stands in contrast to the ornamented and entertaining episodes of the Tangerine House. The world we encountered (and continue to encounter) when we fostered and adopted my son. At the same time, we have a middle grade audience in mind and are sensitive to their worldviews. We’ve read these stories to kids of a variety of ages and pay close attention to how they react, what questions they ask, what sections they choose to skip (when they reach choice points). Again, thank you for giving this story a read. We hope you’ll stay with us as the episodes continue! Thanks for filling in the extra background here. It’s nice to know a little bit more about what’s going into creating these. And I remember thinking that the handling of loss in the fire scene worked very well.